The financial facet of Mother’s Day is, in one word – massive! According to the U.S. National Retail Federation, in the last 10 years, there has been a staggering rise in estimated spending from $14.1 billion back in 2009 to $23.1 billion in 2018. These figures definitely put this holiday among the top gift-giving days. Have you included it in your annual marketing strategy yet? Unfortunately, when we talk about promotions, a lot of businesses board the winter holidays train and put all their efforts into promoting products and services around Christmas, Black Friday, and Cyber Monday. While this strategy, without exceptions, yields positive results, allocating a part of the budget to Mother’s Day promotions is bound to benefit your branding efforts. Mother’s Day celebrates mothers, motherhood, maternal bonds, and the influence they have on society. It’s celebrated in over 40 countries around the world on different dates, with most celebrations happening in the first half of the year. The idea to honor all mothers came from Anna Jarvis. After her mother’s death in 1905, Jarvis organized the first Mother’s Day celebration in 1908. Her idea of the holiday was to organize a special day where we would spend time with our mothers and thank them for all that they did. Yes, showing respect, love, and appreciation to our mothers should be something we do every day, but this special occasion gives us a chance to show how much we care about them in a more intentional and spectacular way. Since today’s consumers are all about creating interactive and lasting relationships with companies, the idea of connecting your brand to the values of Mother’s Day and motherhood is priceless in terms of customer loyalty. Apart from building strong bonds with your loyal customers, earning a profit is also cited as an important goal of a promotional campaign. Time to redo the marketing math now, huh? Don’t worry, we’ve got you covered. This is just the right time to start planning your Mother’s Day contest strategy. The next big thing Mother’s Day celebrates is emotions – love, care, and respect we feel for our mothers, which adds another important feature to the promotion: emotional aspect. Namely, it needs to be carefully thought through because you don’t want to turn the campaign into a cheesy, corny thing, as many are easily repelled by such a campaign tone. Meaning and message simply have to be aligned with the values of this holiday. Do everything by the book and in accordance with the contest and giveaways laws and regulations. Let’s take a look at a few ways you can check all the boxes off and create a successful Mother’s Day contest. Speaking of the keeping-it-simple aspect, photos and videos seem to be the real winners here. The stats show that there are over 3.7 billion mobile device users, most of which have a camera. It’s never been easier to create photo/video content and access and upload it on the Internet to share with your friends and family. That’s why a photo-based contest can create quite a buzz. Weeks 3 and 4 for the voting period and time for contestants to promote their content and ask their community to vote. The “friendly” element of the competition keeps participants engaged and encourages sharing their content for more exposure. There are so many ways you can connect your brand to the Mother’s day depending on your niche. For instance: if you are in the travel industry – ask for photos of a mom’s favourite place; if you’re in the beauty business – a photo of a child and a mother with a face mask. Simply be creative – there are countless opportunities to take advantage of. like and follow your Facebook and Instagram or other social pages, but make sure these features are optional to avoid repelling those who don’t have social media profiles. Don’t forget that you can use the submitted photos only if you have clear permission from the contestants. Therefore, ensure that all the rights and waivers in your contest rules are clearly stated. Another great way of engaging and interacting with your audience is through text-based contests. Again, keeping things nice and easy is a priority, so asking your audience to submit around a 30-word text material or a short story is just about right. This type of contest engages your audience and asks them to share something personal, hence creating a stronger emotional bond with your brand. Sweepstakes is a great way to build your email list and sign-ups and collect information about who your audience is and what they like. Sweepstakes campaigns are simple and effective and people seem to love them because in most cases they just have to register and subscribe to an email list to participate. This is also a chance for you to shine in the customer relationship department. The importance of a good follow-up can’t be emphasised enough. Create a nice Thank You Page and offer discount coupons to the contestants. Adding the element of surprise will certainly work those engagement muscles. How? In your sweepstakes announcement, don’t tell the audience anything about getting discount coupons if they decide to partake in the contest. Instead, send the coupons along with your Thank You email and see your email list skyrocket. The philosophy behind it is simple – everyone likes the attention. Show your existing and potential customers that you care and stay connected with them even after the promotion ends. – Encourage them to purchase your products/services by including discount codes and/or coupons. You can organize a Facebook timeline sweepstakes as a part of your Mother’s Day promotion. The thing about this social network is that it only allows this kind of contest among comments OR likes. However, it’s allowed to encourage participants to take other actions, like follow your page and share a post. Focus on boosting your initial post, and others should work well thanks to organic reach and engagement. It’s very important to reach back whenever customers reach out to you. Engaging in a conversation with your customers shows them that you’re listening. If you belong to the food or fashion and beauty niches, Pinterest is a great place for your Mother’s Day contest, and history has shown that tips and how-tos are the most commonly searched items on this platform. 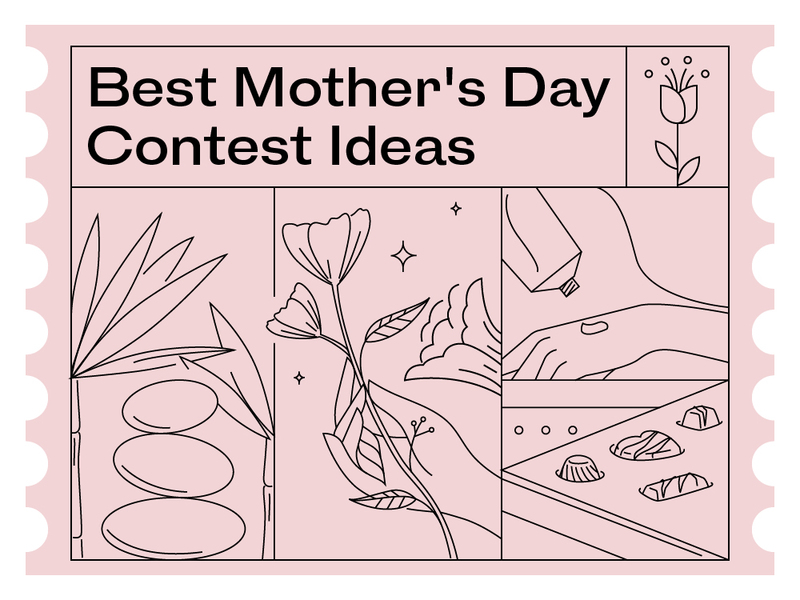 The concept of a Pinterest contest is either to ask your audience to pin your post or deals from your company on their board, or to pin other images that represent their idea of the best Mother’s Day. Alternatively, and this is for the more creative ones – create a pin which they would tie to your brand. It’s also a good idea to include Facebook and Instagram follows and likes as optional and bonus entries for your contest. Quizzes have a huge potential of going viral across social media, especially on Facebook. You can create a single quiz or even a bundle of 3 to 5 themed ones. Here’s what you can do: ask contestants to enter your quiz in exchange for a chance to win prizes for their moms. Something like Which celebrity mom is your mother? will create engagement on social networks because quizzes are fun, very popular, and easy to share. Adding a prize as a bonus can encourage contestants and people in their community to engage even more. As a result, it will boost your database and you can use the information to narrow down potential customers and target specific groups of users. Creating alliances with bloggers and influencers in your niche can also drive value to your contest. If you find influential people who can promote your contest and expose your brand to a wider audience, it can help you spread the word even more effectively. The right people for you are the ones that embody your target customer. 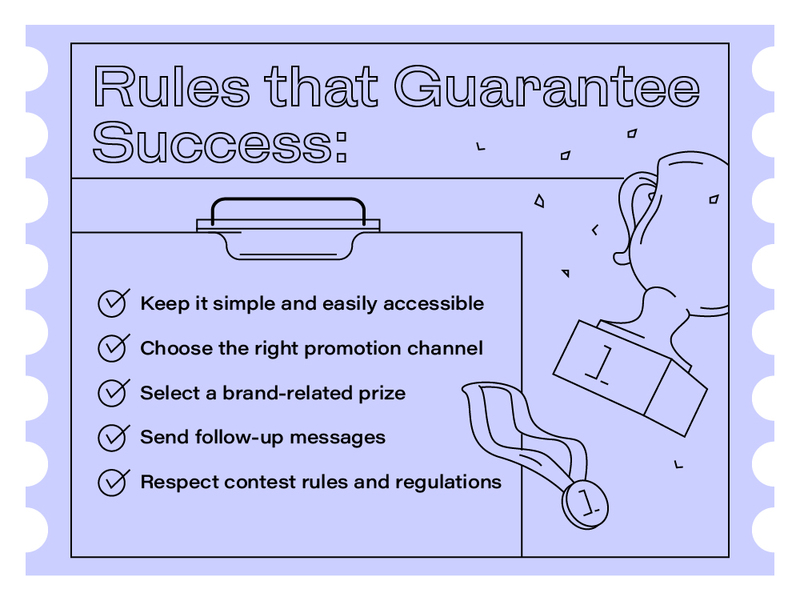 However, you need to be careful with this strategy because it could affect the quality of your contests entrants and collected data. As you know, the legal aspect of organising any contest needs to be taken seriously. The U.S. laws and regulations regulate how these type of promotional campaigns have to be conducted and many states have individual considerations when it comes to this. You need to be clear and straightforward with your contest rules to continue to conduct your campaign within the legal framework and avoid any issues in a form of financial penalties and repercussions. By setting clear rules, you also avoid any type of confusion among entrants, in that way enabling easier management of the submitted content and the entire campaign. Since this is a contest where all the submitted entries will be evaluated based on a set of judging criteria, make sure you are clear and transparent about the rules to stay in good relations with all contest entrants and choose winners based on contribution and other clearly stated judging criteria. Also remember that different platforms like Facebook, Instagram, Twitter, and Pinterest do not have identical policies regarding organising contests. PromoSimple has composed a Contest Rules template for you to implement into your next campaign. You can download the PDF document here. 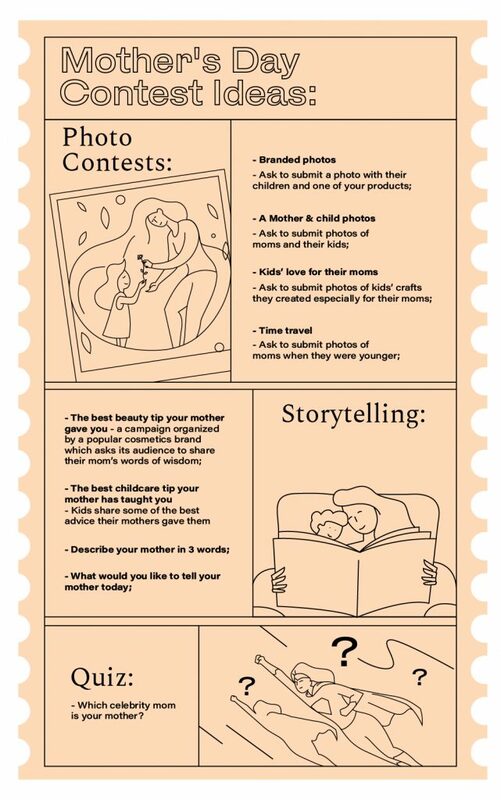 A Mother’s Day contest is a great way to engage and interact with your consumers and fans. Connecting your brand to the values this holiday celebrates, like motherhood and motherly bonds, will contribute to a positive association your end users have with your brand. There are many benefits your company may reap from a well-organized contest campaign. Apart from building your email list, creating a buzz around your brand, conducting market research, and gaining valuable insight from the people loyal to your company, long-lasting customer relationships and authentic customer experience can be your top gains from this promotion, and the content you receive can be used later in other marketing strategies.